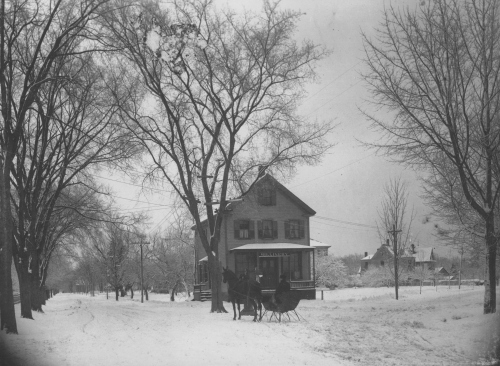 This picture was taken about 1890, at the intersection of Webster Street and May Street. 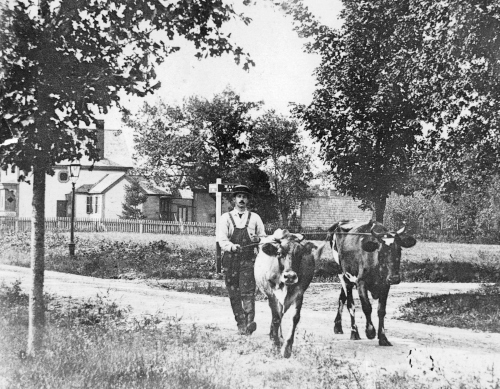 Dairy farming was the main agricultural activity in Needham in the late 19th century, and many households kept at least a few cattle. 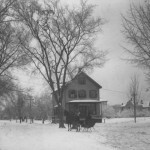 The house in the background is the Nutter-Twigg House (built in 1853), which still stands on Webster Street. 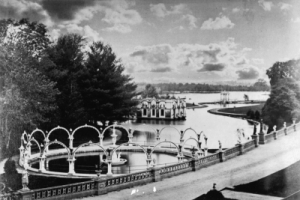 The kerosene street lamps were installed in Needham in 1883. They were replaced by electric lights about ten years later. 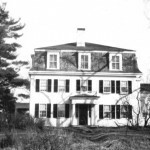 The Townsend House, also known as The Old Manse, was built for the first minister of the First Parish (Unitarian) Church. At the time it was built, the house stood near the old town center (the intersection of Nehoiden Street and Central Avenue), and was a center of town activity. Needham's East Militia Company assembled at the house before marching out to Lexington in 1775. Throughout the Revolutionary War, the Militia's weapons and gunpowder were hidden there -- a safe place, since the British would not suspect the minister of hiding guns. A third story and mansard roof were added in the 1850s. 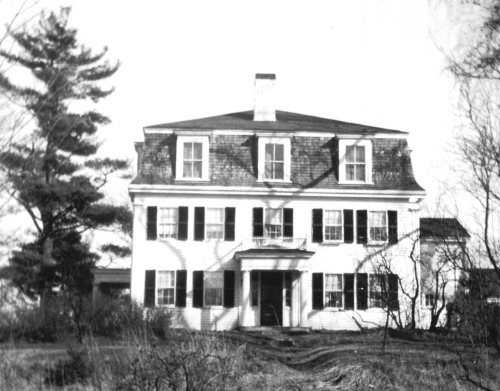 The house is still standing on Central Avenue; it is set back from the road on a long driveway, but can be readily identified by the "1720" painted on the chimney. 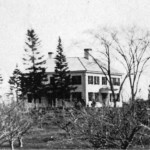 This picture was taken of the house sometime before 1875, and shows how it looked when it was first built. This shop stood on the corner of Great Plain and Dedham Avenues. 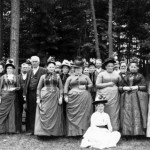 Miss Boyd owned one of the three millinery shops in Needham in the late 1800s. In her shop she sold hats and gloves, as well as other accessories for women to wea The house in the right background is still standing on Dedham Avenue. In 1898, trolley tracks were laid along Great Plain Avenue. 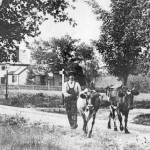 The Baker Estate, or Ridge Hill Farms, was located on 800 acres along Grove Street, near the western border of Needham. The estate was owned by William Emerson Baker, a Boston merchant who made a fortune by selling sewing machines in the 1850s. 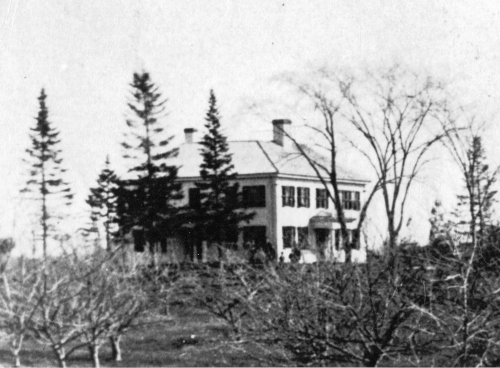 Mr Baker sold his business in 1868, and purchased his land in Needham as a summer residence. 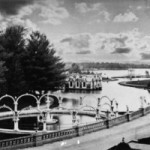 Over the next twenty years, he built more than 100 buildings and other attractions for the amusement and education of himself, his friends, and the public. Mr Baker was a supporter of several progressive causes, and spent his time and money to help them succeed. He helped to establish the Museum of Natural History (now the Museum of Science), the Museum of Fine Arts, and the Boston Aquarium. He was active in such causes as the Reconcilition of the North and South after the Civil War, the education of women, and the establishment of a Public Health Service. Sabrina is an artificial lake, which Baker hired men to dig for him. 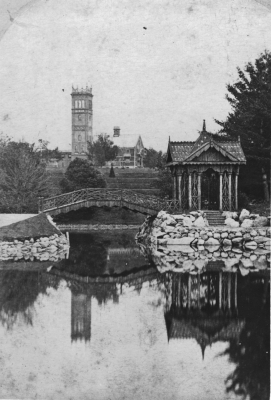 He decorated it with fountains, statues, bridges, and a boat house. He had two boats which he used to sail on the lake. 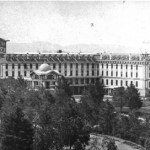 The picture below is of the luxurious Hotel Wellesley. 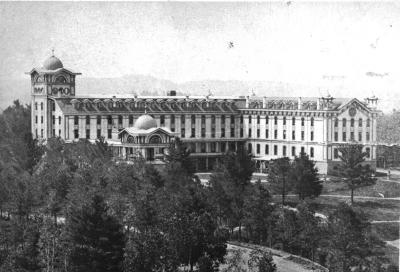 The Hotel had 200 guest rooms and a dining room that could seat over 600 people. Baker purchased this building at the Phildelphia Expostition of 1876, took it apart and rebuilt it in Needham. 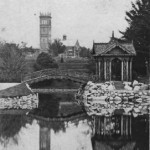 The picture at the bottom shows the Norino Tower, which Baker used for exhibits on science and industry. 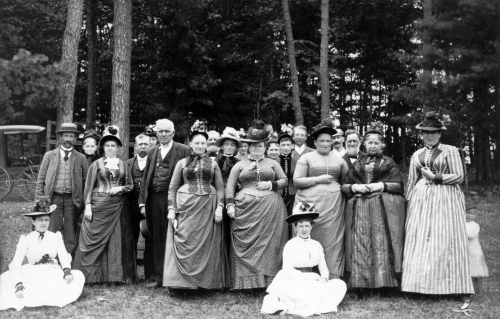 The woman at the far right is Henriette Zirngiebel Wyeth, the mother of the famous illustrator N. C. Wyeth. N. C. Wyeth (as a small child) can be seen hiding behind her skirts.